Representational Systems: How we mentally code and process information: Visual, Auditory, and Kinesthetic. This technique has a variety of applications including increasing motivation, emotional intensity and rapport. Mirroring: Adopting characteristics of another person’s physiology, words, etc. in order to build rapport. An example of this would be to casually and naturally take a sip of water when the individual you are establishing rapport with sip’s their water. Shifting Perceptual Positions: Shifting between different points of view, one of three mental positions (self, another person’s perspective and from an outside person’s perspective). The person with the most psychological flexibility will always be the one with the most influence. Developing Well-Formed Outcomes: Developing a specific, sensory-based result. This has a variety of applications especially in the area of goal setting. Take the time to be specific, strategize intelligently and set a specific completion date with accountability. State Management: Includes a variety of techniques including changing physiology. A change in your psychology is the foundation for a much needed change in your physiology. Think of a picture, a picture of a memory, that when you see it, makes you feel good. That’s right. Notice how the picture looks… and just how good does this make you feel? Now make the picture bigger, brighter, and closer. Notice how your feelings change. Try it now, before you read on. Now take your picture and make it small, dim, and distant. Turn it from color to black and white, and if it’s a movie, make it into a still picture. Notice how you feel when you look at it now. Are your feelings stronger, or weaker? More or less positive? Now put the picture back the way you had it to begin with. For most people, making a picture big, bright, intense, and close makes their feelings stronger and more positive. And making it small, dim, black-and-white, and far away makes their feelings weaker and less positive. People who feel chronically depressed or are clinically diagnosed with depression often have a pattern of making their pleasant experiences into small, dim, gray, far-away pictures. When they look at their memories, nothing makes them feel good, and life seems joyless. Such a simple thing can make a profound difference … since most of us look at internal pictures hundreds or thousands of times a day, this gives thousands of opportunities to feel good, every day. Do you have an internal voice or voices that make you feel bad? Maybe it seems repetitive… or criticizes … or reminds you of the things you did that you perceived as stupid or dumb, or might do, or the things that might go wrong in the future. It doesn’t seem very friendly … and even when it has good advice, it’s hard to listen because of the way (tonality, volume and aggressiveness) it speaks. Listen to your inner critic. (If you have several, start with just one.) Notice where its voice is coming from. Do you hear it in one ear, or both? Whose voice do you hear? If it’s your voice, do you sound like you, or do you sound like you’re speaking with someone else’s words? Is the voice tone friendly, or hostile? What does the voice say? Now move the voice to your clown face. How does that change your response? What if speaks in your other ear? From across the room? From the other side of the street? Try changing the volume. Add some static, like a radio station with poor reception, How do you feel now? Experiment with the sound of the voice. If it says harsh, hostile, or angry words, make it sound like Mickey Mouse on helium, have it say them in a sweet, loving, supportive voice. What if it sounds like Daffy Duck? Whispers? Squeaks? Give it a silly lisp, and play goofy music as it speaks. How do you feel as you listen? Command the voice that you will not accept listening to any negative BS, you will only listen it if it tells you what you do right, makes helpful suggestions, and speaks in a friendly, supportive way that you will want to listen to. How does it respond? Once you master your emotions you are in control of your destiny, conquer the mind and your body will follow. It is when you make a change in your psychology that you will create a much-needed change in your physiology. Believe it or not, you can change your relationship with internal voices, make friends with them, and achieve inner harmony. An internal voice that supports and encourages you, and gives you good advice, can do a lot to make your life better. Meta Model: A model with a number of linguistic distinctions that help identify language patterns that hide the meaning through deletion, generalization and distortion. 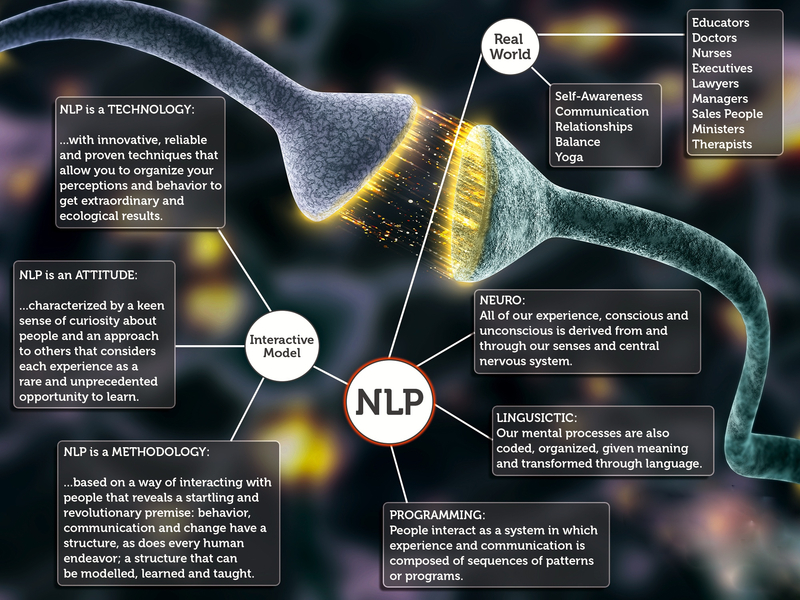 This model is very beneficial in improving communication and helping to create change. People respond to events based on their internal pictures, sounds and feelings. They also collect these experiences into groups or categories that are labeled with words. The meta-model is a method for helping someone go from the information-poor word maps back to the specific sensory-based experiences they are based on. It is here in the information-rich specific experiences that useful changes can be made that will result in changes in behavior. It is discovering your primary question, which is a question you consistently ask yourself on a daily basis and changing it to a question that better serves you to create positive and lasting change. Swish Pattern: Very powerful technique of ‘swishing’ an old, unwanted behavior with a new, wanted behavior. This technique is very helpful in making lasting changes in habits and behaviors. The Visual Swish technique enables us to quickly dissolve the feelings attached to unwanted thoughts and to deal with useless responses. In the Swish we replace the unwanted thought or response with a more useful and appropriate one because the Swish re-directs thinking. It is an instruction to the brain No, not that – THIS!! This is a valuable technique for managing your own thinking, states, and behaviors. Each time you use the Swish you are training yourself to instantly re-direct your thinking from useless topics to more resourceful ones. Having selected the Replacement Feeling see and hear a detached and associated version of yourself experiencing this feeling. It is quite important that this image is dissociated. Enhance the detail and the quality (sub modalities) of this until the image is quite compelling. What is it that you respond to? How you know when to have the unwanted response or reaction? Have the ‘negative’ image become smaller and shoot off into the distance. At the same time have the ‘positive’ replacement image become larger and closer until it replaces the negative image completely. Imagine a “swish” sound as you do this – hence the name. That’s one Swish sound. After each Swish round blank your mind, fully! Think of something else or visualize your favorite color. Breathing easily as you do this since some people tend to hold their breath while concentrating on doing the Swish. It is crucial to the success of the Swish to clear your mind or turn your attention outside before you do each round. This is a common belief. You can do an Auditory or a Kinesthetic Swish, too. So if you (or the other person if you are assisting someone else) believe that you have difficulty in visualizing you could accept this belief and use a kinesthetic or auditory swish. Alternately, and often more effectively, you can act ‘as if’ you are visualizing, i.e. you pretend that you are visualizing and simply follow the steps listed above. Curiously, this will often work just as effectively!